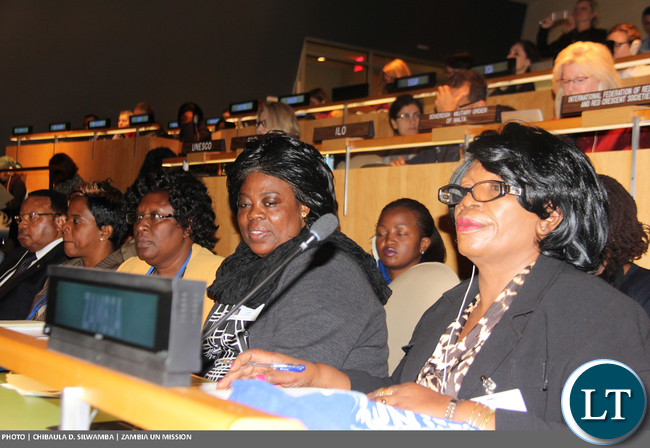 Zambia has reaffirmed its commitment to the advancement of women, with particular emphasis on the promotion of females’ empowerment and attainment of gender equality. 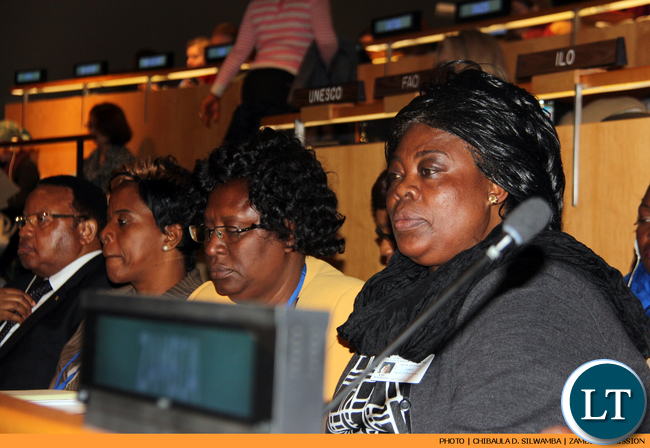 Delivering Zambia’s national statement at the 60th Session of the Commission on the Status of Women (CSW60) at United Nations Headquarters on Tuesday, Minister of Gender Honourable Professor Nkandu Luo said the Government is fully cognisant that guaranteeing women’s human rights in the Constitution was the starting point in achieving gender equality and women’s empowerment. She said the Zambian Government in 2015 revised the National Gender and Child Policies to address new and emerging issues including child, early and forced marriages. “Zambia in collaboration with the African Union Commission held the first Girls’ Summit to end child marriages in November, 2015. The Summit heightened the political commitment by Government and secured new commitments from stakeholders to invest more on women and girls particularly by ending child, early and forced marriages and pledging to leave no one behind,” Prof. Luo said. The Minister, however, said Zambia still faces a number of challenges in empowering women and the attainment of gender equality, including high poverty level among female headed households. Prof. Luo said the 2030 Agenda for Sustainable Development gives renewed hope of eradicating poverty among the most vulnerable groups in society particularly women. She said the Zambian Government will this year launch the Women’s Bank whose primary objective is to cater for the banking needs of women to promote economic empowerment. “The Government is already implementing a chiefdom-led job and wealth creation Agriculture Development programme through Value Chain Enhancement (ADVANCE) Project that aims at strengthening local capacity for mobilisation of communities and farmer groups to participate in the agriculture value chains; stimulate local economic development through creation of small and medium enterprises (SME’S) among the youth and women,” the Minister said. Prof. Luo said Zambia is implementing the HeForShe campaign, which President Lungu launched last year, aimed at mobilizing men to support women and girls. “As we embark on the ambitious road of implementing the transformative 2030 Agenda with the commitment of leaving no one behind, it is befitting that development agencies and other partners come on board to assist Zambia fulfil its vision of women’s empowerment and the attainment of gender equality and equity,” said Prof. Luo. 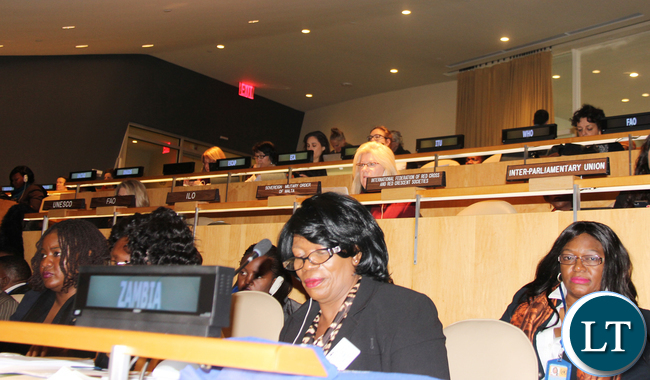 The CSW60 opened at UN Headquarters on Monday with a priority theme focusing on women’s empowerment and its link to sustainable development. The two-week annual meeting attracts hundreds of decision makers, including leaders of Government, civil society, academia, celebrities and women’s movement, from across the globe. First Lady Mrs. Esther Lungu, Tourism and Arts Minister Jean Kapata and His Royal Highness Chief Nyamphande of the Nsenga people of Petauke District are in the Zambian delegation. This is a joke, right? A young woman was stripped naked a few days ago on your watch. She does not feel empowered by diddly squat right now. They send uneducated people who only care about the Ngwee so what do you expect. Gender equality while the president’s wife is in New York promoting women issues yet says nothing about the girl who got stripped. An elderly woman was brutally hacked with machete’s and later died but non of these ugly faces said a thing. Where is the women’s lobby group on this one? We have *****s in high places who don’t even support the causes they claim to be passionate about. Waste of revenue by flying, hotels, food plus they even go shopping using tax payers money. Shame on all of them. For (P)ATHETIC (F)emale Empowerment Failures, unlawfully stripping a woman NAKED, in full view of a FEMALE VICE PRESIDENT, & not acting means empowerment, & the way forward. Why would I expect more from a bunch of Corrupt Jokers, who appointed “Women’s Public Enemy No1- General Kanene”, as ambassador for Women’s rights, & emancipation. PATRIOTIC F00LS have failed in every department of Governance!! To these above shameless women, who still ignore the plight of that poor girl (fellow female of the species)’ stripped in public,- all that matters is a full belly, corrupt dollars in their purses, & like Jay Jay said, those WIGS covering their shameless heads. WIGS, WIGS, WIGS, NOT WOMEN ADVANCEMENT. SHAME!!! Did you tell the UN that your party (PF) youths stripped a girl naked on Youth Day in front of government ministers and the police? Useless bunch of ugly women telling lies at the UN.